*Discount - 5% off each payment if paid in full by September 10th and February 10th. *Discount - 10% off annual tuition if paid in full by September 10th. Group classes are defined as having 4 or more students. Classes with less than 4 students may be charged at private class rates. same household, paid by the same person. Please note that tuition does NOT include the costume/recital fee. There is a $15 late fee added for monthly payments that remain unpaid by the 10th of the month plus an additional $5 for each month it remains unpaid. A $25 charge will be applied to your account for all returned checks. ∙ There are NO REFUNDS for missed lessons or for not completing the month. ∙ We reserve the right to hold costumes and/or other ordered merchandise if you have an outstanding balance on your account, including any late fees or returned check charges. All payments will be applied to tuition first before funds will be applied to costume. All payments will be applied to past due tuition first before funds will be applied to costume, shoes, tights or other items. ∙ The easiest way for you to make your monthly payment is to put your check in an envelope and leave it at the desk. If the parent or grandparent writing the check has a different last name than the child, please write the child's name on the check. ∙ All cash payments will be given a receipt so please make sure you receive one. ∙ Please note that the calendar allows for some inclement weather days built in to the year. If your class does not meet 36 times during the year we will either reschedule classes or you will receive a credit for the days missed because of the weather. ∙ Also, please remember that you are paying an annual tuition broken down into 10 monthly payments. This means you will pay the same amount every month whether there are 2 lessons or 5 lessons in the month. ∙ All class drops must be made in writing. Tuition charges will continue to accrue until we have received notification that you are dropping a class. We are excited to tell you about our referral program! For every person you refer to Farmington School of Dance, you can get a $15 credit! On our enrollment forms we include an area for new students to list a name of a family that recommended/referred them to Farmington School of Dance. This space (if completed by the enrollee) will award the current dance family a $15.00 credit for each referral. Enrollee must list your name on their enrollment form at the time they complete the form. No one will be able to add a name after they have completed and submitted the form. The new student must continue to be enrolled and all fees current (including costume and recital fee) for two (2) months from the date of enrollment. Each family who makes a valid referral will receive a gift certificate at the end of the two months which they will be able use as they see fit through June of 2018. This is our way of saying THANK YOU for helping Farmington School of Dance become a recognized name in dance instruction in the area! Word of mouth is the best form of advertising and you have the potential of helping us keep your costs affordable. Be prompt for class, dressed correctly with hair up and no jewelry. No gum, food or drink inside the building. No running or horseplay in the studio. Keep your hands to yourself. Red means stop! Stay away from the mirrors for your safety. Do not hang, push or lean on the ballet barres. Mouths and tap shoes quiet while the teacher is talking. Pay attention and be a good listener in class. Wait quietly while others have their turn. Put your trash where it belongs. Keep your belongings neat & in their place. Dance bag in the classroom, all other items on a shelf or under a chair in the lobby. As a courtesy to the instructors and the other dancers in your class with allergy and/or asthma problems, please do not bring animals into the building or wear perfume to dance class. The water cooler is for student use only. Wear a cover-up to and from class. No street shoes in the studio area. Please insist that your child use the restroom BEFORE they come to the dance studio. If I let one child go to the bathroom during class, I usually end up with half the class needing to go and my attention is split between the child in the bathroom and the rest of the class. Students may go to the bathroom during our shoe change break but class will resume without them if they are not ready when we continue. If your child has a medical need to go to the bathroom more frequently, please indicate this on your registration form. In our tradition of teaching and learning, if a student is given a correction, it is considered the highest form of a compliment. Students should realize that their instructor has taken time to help correct them because the teacher cares about their overall technique and wants to help them improve. Corrections are not an opportunity to argue with the instructor, but an opportunity to learn. Please also note that there will be times when the teachers may employ hands-on adjusting corrections to the students. We believe that all dancers should develop a sense of respect for themselves, the other dancers in their class, and the instructor. In order to help foster that respect we ask that students refrain from speaking socially during classes and for students to treat others as they would like to be treated. Students are expected to behave in class and listen to the teacher at all times. Teachers will verbally discipline students if necessary and students that are disruptive to the class or who continually act out in an inappropriate manner during class may be asked to leave the class or may possibly be moved to a different level. We place a strong emphasis on classroom behavior and manners. These concepts include learning how to take turns, waiting patiently, working together with others, showing respect for self, classmates and teachers and having a positive attitude. All of these skills will be needed throughout a person's life - in and out of the classroom. Parents and students - please DO NOT bring food or drink of any kind into the building. This includes suckers and other candy. Anything spilled or dropped on the floor could ruin your child�s or the instructor�s dance shoes. Dance students are not allowed to chew gum in the studio. Also, do not bring water bottles into the studio. We have a water cooler available for student use during class. We are proud to state that our studio is substance-free! We expect that you as parents will support our efforts to make sure our students steer clear of drugs, alcohol and smoking. **Students taking jazz can wear spandex shorts over their leotard & tights or a tight-fitting stretch dance camisole top with spandex shorts & tights. In order to be able to work in a physical environment, one must have the proper dancewear. All girls are required to wear a leotard and tights to class. Bare legs are not appropriate for dance class. Students taking jazz can wear spandex shorts over their leotard & tights or a tight-fitting stretch dance camisole top with spandex shorts & tights. Students may not wear bracelets, necklaces, big or dangling earrings or any other jewelry during class. Leave your jewelry at home. We are not responsible for students� belongings left unattended during or after class. Girls may not wear shirts during class. Dance students may not wear shorts, jeans, sweats or other long pants during class. During cold weather, the instructor may allow students to wear a close-fitting shirt or sweater. PLEASE do not purchase skirted leotards for your dancer! Younger students play with the skirts instead of paying attention in class AND the skirts are dangerous when it's time for tumbling because it's almost impossible to spot them with skirts in the way. The girls are welcome to wear a separate skirt to & from class, but not during class. Older students (age 9 & up) may wear a simple wrap skirt over their leotard for ballet. Body-suits with a snap-crotch should not be worn. Costumes are NOT acceptable as class dancewear. All students must have the proper dance shoes by the 3rd lesson. Dance shoes must never be worn outside and street shoes should never be worn on the dance floor!! Please write your child's name inside their shoes, and periodically check the fit of their shoes. Unlike regular shoes, a correct fit for ballet and jazz shoes means that they fit "like a glove". However, since young dancers are still growing everyday, this would not be practical. You may wish to purchase your shoes with a little room to grow, but there should not be too much excess space at the toe or heel. Often, parents think it is time to purchase new shoes just as the toe is reaching the boundaries of the shoes - in fact, they are just beginning to fit correctly. Only when the shoe is so tight that the toes can not lay flat and square on the floor will you need to purchase a new pair. The soft leather will stretch and mold to the shape of the foot as the child wears them. While you may also wish to purchase tap shoes with some growing room, be sure not to go too big. If students� feet slide out of their shoes while walking, they will find tap dancing a near impossible feat as they will not have the strength to manipulate the shoes and risk slipping out completely while dancing. If you are buying dance shoes with a small amount of growing room, please include a pair of socks in your child�s dance bag that they can wear with the shoes until they have grown into the shoes. Hair must be worn up and off the face. Long hair must be secured so that it will not hit anyone while moving or turning. Hair must be fixed before class begins. Students should NOT have to touch their hair during class. Please keep clips or barrettes in her dance bag to secure long bangs and whispies. Please use only soft ponytail holders and/or flat clips so that she many participate in tumbling activities. Students will need to leave their belongings (coats, backpacks, street shoes & clothes, etc.) in the waiting area. The only items your dancer will need to take into the studio area are their dance bag and shoes. Make sure you take ALL of your belongings with you when you leave the building. Students who have forgotten their proper dance attire will be given something to wear from the extra dance clothing box. If you use an item from this box, either take it off before you leave or sign out the items you use, wash the clothing and bring it back the next week. If you have dance clothes that your child has outgrown, please consider making a donation to our extra box. The first class is an important one for young children - for many, it may be their first school experience. It is often harder for you as a parent to leave your child for the first time than it is for the child, but your child can't really establish a trusting relationship with their teacher if they don't think you trust them enough to leave them alone. Also, concentration, focus and understanding are easier for children without the interruption of observers. If your child is frightened in the beginning and does not want to come into the studio, we will allow you to sit in the classroom and watch the class together. Some children may want you to stay for just a few minutes; others may need your presence for a few classes. We will encourage your child to participate but they will need to do so in their own time. As soon as your child feels comfortable to dance on his/her own we ask that you quietly leave the room. Even watching the class by themselves is the first step towards participation. Please do your best to come to class each week and arrive on time - these consistencies are great contributors to a student�s feeling of security. Even if you think it isn�t working, please give your child at least a month to become accustom to the studio and the dance lesson before thinking about dropping your child from dance. Some children will adjust right away, some take a little longer than others, especially if this is their first experience in a structured setting/classroom. �Once your child adjusts to their new class, we will not be opening the viewing window for parent observation on a regular basis. If the class is paying attention or we have something we are particularly proud of, we may open the window for the last few minutes of class. This is for your child�s benefit. When the blinds are open regularly, dancers feel they have an �audience� & must entertain you and having viewing days even once a month was causing backward progress for the class. They will have a more beneficial class when they are allowed to concentrate without being watched over. Having just a few observation times will allow you to see your child�s progress without becoming �numb� to their weekly activities. While observing your child�s class, if you see that the children are distracted by their observers, please step away from the viewing window. Do not tap on the viewing window and do not try to talk to, discipline or critique your child during class. Your child needs to listen to & follow their teacher�s instructions while they are in dance class. Please remember that the waiting area is NOT soundproof. We ask that you keep your conversations low and be courteous to those in class, even if it is before or after your child�s class, as other children may be starting or finishing their own lesson. We love babies and children, but since the waiting room is not soundproof, please do not bring siblings to sit in the lobby during class. Your dancer will get much more out of their class without worrying about who is playing, squealing or crying in the lobby. The observation windows are only for parents. Please do not use this as a chance to entertain grandma, grandpa, aunts, siblings, cousins, friends, etc. They will all have an opportunity to see your child perform at the recital in June, when your child is ready for an audience. Because the waiting area is small, please limit observers to one parent per child. We reserve the right to ask any disruptions to the class to be taken outside the building. Please insist that your child use the restroom BEFORE they come to the dance studio each week. Our viewing windows will be open the first week of the dance year for parents to watch their child in class. While observing your child�s class, if you see that the children are distracted by their observers, please step away from the viewing window. Do not tap on the viewing window and do not try to talk to, discipline or critique your child during class. Your child needs to listen to & follow their teacher�s instructions while they are in dance class. Once your child adjusts to their new class, we will not be opening the viewing window for parent observation on a regular basis. If the class is paying attention or we have something we are particularly proud of, we may open the window for the last few minutes of class. This is for your child�s benefit. When the blinds are open regularly, dancers feel they have an �audience� & must entertain you and having viewing days even once a month was causing backward progress for the class. They will have a more beneficial class when they are allowed to concentrate without being watched over. The observation windows are only for parents. Please do not use them as a chance to entertain grandma, grandpa, aunts, siblings, cousins, friends, etc. They will all have an opportunity to see your child perform at the recital in June, when your child is ready for an audience. Also, because the waiting area is small, please limit observers to one parent per child. Please remember that the waiting area is NOT soundproof. We ask that you keep your conversations low and be courteous to those in class, even if it is before or after your child�s class, as other children may be starting or finishing their own lesson. We love babies and children, but since the waiting room is not soundproof, please do not bring siblings to sit in the lobby during class. Your dancer will get much more out of their class without worrying about who is playing, squealing or crying in the lobby. Also, our lobby was not designed to allow for multiple people per dancer to come in to wait. If you have a concern with anything from understanding why we pli�, to costume choices, or even if something at home is affecting your child, please talk to the instructors. We cannot know there is a problem if you do not communicate it to us! Also, sometimes, students take information out of context or misunderstand things I have told them. This is why I put as much as possible in writing. However, if you have any concerns or questions, please come to me and I will give you a full explanation. Our studio publishes a periodic newsletter which may be produced electronically & emailed to you. Each newsletter contains additional information which is not included in this handbook, upcoming studio events, other studio news and a calendar. I realize we all have busy lives these days, but for your dancer�s benefit, please try to make yourself aware of our announcements & upcoming events. Because there is a limited amount of time between classes and I want your child, and all of my students, to get the most out of their class, I ask that you either call me with any questions you may have or leave me a note at the desk and I will get back to you as soon as I can. My cell phone is to be used only in emergency situations or to text to let us know of an absence. If this text is sent during class time, you may not receive a reply. All other texts will be ignored. If you need to contact us about a question or concern, the best way to reach us is by phone, email or facebook message through the studio facebook page. Messages sent to our private facebook accounts will also be ignored. In this age of electronic communication, it may seem a simple task to shoot off an email at any hour. However, we will only be returning phone calls or emails during regular business hours. The studio is active on Facebook, Instagram, YouTube and Pinterest. We would love for you to follow us on any or all of these formats. Facebook is the best one to follow to stay up-to-date on our events and happenings! And we love to post pictures of the dancers working hard in class! We want everyone�s experience at our studio to be positive. When people encounter drama or negative posts about our studio on social media, it can change their opinion of our studio or of dance in general. Therefore, if any post or text is brought to our attention that could be deemed as opposing or degrading our studio or teachers, or bullying another dancer, it will be grounds for an immediate dismissal from our studio, without refund. This includes posts coming from the dancer, since we expect parents are watching their accounts and supervising what they are posting. Every student representing our studio is expected to carry themselves in a way that brings dignity and pride to themselves, their fellow classmates, their teachers, and the studio as a whole. Once again, if you have a concern with anything you�ve seen or heard at the studio, please come talk to us. Many times there are misunderstandings and unless you get your information from us, you could be causing yourself unnecessary stress or concern and we cannot know or help if you have a problem unless we know about it. Thank you to the parents that have already supported and liked us on social media! Your approval and endorsement helps us stay active in the community and on the internet. Students who attend classes on a regular basis are those that experience the most from their dance education. Often when one student is absent, an instructor will need to repeat an entire lesson plan, arrange an extra rehearsal for the entire class, or at the very least review choreography. Each class can be hindered by poor attendance or can progress nicely with all striving to attend classes regularly. Also, attendance is taken into consideration when placing students each year. As a courtesy, please call in advance if your child will not be able to attend a class. If they are able to and they are not contagious, they should attend class to watch and observe new choreography, even if they are injured or a little under the weather. If a student misses more than 3 or more lessons between January & June, a private class may be required to get them caught up on the choreography they have missed. See the private class section for the fees involved for this class. We reserve the right to drop a student from the choreography and/or the recital for excessive absences. Please arrive for class dressed and ready to start including hair pulled back. Students should put their dance shoes on as soon as they arrive, leaving their street shoes on the rack in the lobby, and be ready to start our warm-up as soon as class begins. Being consistently late to class and missing our warm-up time is not acceptable. Students who miss our warm up time will be asked to stand to the side & warm up on their own so that we avoid injuries caused by not warming up properly. Please do not bring your child more than 10 minutes early. Our waiting area is too small to accommodate 2 classes of children and the extra noise of people coming in early can disrupt the class in session. If there is a break before your class starts, please allow the previous class time to get their belongings and get out the front door. This will make the transition period easier on everyone. If there is not a break before your class, please come in quietly and as soon as the previous class has ended, be ready to walk in & begin your warm-up. Students under age 10 may not be left in the waiting area before their class without their parent. To avoid conflict of interest it is a policy of the Farmington School of Dance that no student shall be enrolled at any other dance school without the prior knowledge and approval of the director. You and your child are making a commitment of finishing the entire dance year to the instructor and the other students in her class. Part of the dance education your child is receiving includes teaching the idea of commitment and finishing what you start. Even if you think it isn't working, please give your child at least a month to become accustom to the studio and the dance lesson before thinking about dropping your child from class. Some children will adjust right away, some take a little longer than others, especially if this is their first experience in a structured setting/classroom. Very often, I see parents allowing their children to quit dance, especially in the last few months before recital. This makes it very hard on me, as a teacher, to re-choreograph dances at the last minute so that the other children in the class look their best at the recital. It is also letting down the other students in the class and making them work twice as hard at relearning parts. As parents, you�ve also put a great deal of money into lessons and non-refundable costumes. Completing the year will also give your child a sense of accomplishment at recital; knowing they CAN do it! Service Fee charged for anyone who drops after February 1st. This fee must be paid in order to receive costumes, even if your tuition is up-to-date. Please note that there is also a possibility that your costume will be used if the instructor feels that someone needs to step in for the good of the dance and the other students in the class. These groups were created for dedicated students who have the desire to enhance their dancing talents, to experience working as a team, and to build their own self-esteem with the experience of performance/competition. Dancers will be invited to participate in the groups and the instructor�s decision is final regarding these decisions. Invitations are based on a number of aspects, including but not limited to: class performance and participation, technique, ability, enthusiasm, stage presence, personality, account history and/or current balance, attendance and attitude from both dancer and parent. Our team members work on many concepts during competition practices in addition to their regular dance class, including teamwork, expression, confidence, acting and dancing for an audience. We also implement mentoring within our group to make sure that new members have someone they can ask questions of. The performance group participates in mainly local events such as parades, festivals, school programs, talent shows, etc. The Competition Team normally competes at two or three regional competitions in St. Louis and a National competition. They may also be required to take part in a workshop in St. Louis or another area. There is extra time and money involved with these groups, but we find that the experience is beneficial to our dancers. (Please note, these classes are in addition to regular classes and there is an additional monthly tuition fee involved for classes as well as additional costume/accessory charges for the performance team and costume/shoe charges, specific dancewear requirements, competition entry fees and travel fees for the competition team.) Our competition team parents may take part in fundraisers during the year to off-set the costs involved with the competition team. An information packet will be sent out to those students we feel are prepared to be a part of these groups. Please note that a minimum number of students are required to conduct the full team. � Be up-to-date on all regular tuition & costume fees. � Have good attendance in regular group class. � Be age 8 & up (or by invitation of the teacher/studio owner). � Submit $50 deposit per person with application toward private class tuition. (This will be refunded fully if application is not approved.) Remainder of private class tuition is due on/before the day of the first class. 2 or more years at FSDance. � Be taking a regular group class. We will set our private class schedule during Christmas break based on our available times with private classes starting in January. You may mark your preference of available times and mark out a maximum of ONE day/time that you would absolutely not be able to attend. We may recommend the style of dance we think would be best for each dancer. You may mark your preference of which style you would like but please note that your first choice may not be chosen. We will normally pick the music and costume for your extra dance, which must match our recital theme and not duplicate or be similar to any other dance or costume we are already using. You may make a suggestion on your application if you have a song and/or costume you have in mind, but the choreographer has the final say on the type of dance, costume and music used for the private dance. The choreography fee for an extra dance is $135 which includes choreography, music & editing and four (4) 60 minute choreography sessions. This amount (minus deposit) is due in full by your first session. After the choreography sessions, at least two rehearsal sessions are required per month, with a mandatory rehearsal session the week before a performance. The cost for these additional cleaning/rehearsal sessions is $12 per person per 30 minute session which is due at each session or multiple sessions can be paid in advance. More than 2 per month may be scheduled (or requested) as necessary. It is up to the dancer(s) to learn the choreography within the original 4 sessions. If additional sessions are needed to relearn or change the choreography because the choreography cannot be remembered, the cost will be more than a regular practice/cleaning session. You must call to cancel your class at least 3 hours in advance if you will not be there, otherwise you will still be charged for the class. No private lessons will be scheduled unless you are up-to-date with costumes and regular tuition. Costumes prices will vary, but average will be about $85. This average price would not include any props, extra rhinestones, tights, shoes, jewelry, accessories or shipping. If we have several costumes coming from one company, we may be able to waive shipping costs or at least split them between those ordering. For that reason, costume fees for your extra dance are due by January 30th. All routines must be presented for approval 2 weeks prior to each performance in order to perform. Routines that are not performance ready within this time frame will not be allowed to perform, regardless of whether an entry fee has been paid or not. Home practice is strongly recommended in order to prepare for this presentation. It is your responsibility to learn and memorize routines. We will show the dance to mom after the choreography is complete, but other than that, no parents or other observers are allowed. Please note, all choreography belongs to and is copyrighted by Farmington School of Dance and the person who choreographed the dance. It may not be used at any performance not in conjunction with the Farmington School of Dance including but not limited to: any talent show, any other dance recital or in conjunction with any other studio any time in the future without permission. You must obtain written permission from the choreographer and the studio director any and every time the routine is performed. Generally, we don't mind if you want to perform it but we want to know about it first. J And we may ask you to perform other places than just recital. We are often asked to have dancers perform & often don't have any/enough dancers available, so your dance may be used in that manner as well. Submitting an application does not mean you will automatically be approved. Considerations will be taken for how well you know your regular dance routines, your attitude and effort in class, how easily you take and make corrections, your general dance technique, how committed you are to your other classes/your attendance record, your account status and how many applications we receive. When Farmington R-7 Schools are closed because of snow or other inclement weather, we will usually not have dance classes. Please call me if in doubt. I will try to list the closing on the Farmington radio station (KTJJ). If you have supplied us with your email address, I will also attempt to send an email on questionable days. Please note that the calendar allows for some inclement weather days built in to the year. If your class does not meet 36 times during the year we will either reschedule classes or you will receive a credit for the days missed because of the weather. We present a recital each year. This year�s Recital is tentatively scheduled for Saturday, June 22nd at the Farmington Centene Center Auditorium. Stage Rehearsal has been tentatively set for Monday, June 17th, 6PM at the Farmington Centene Center Auditorium. Students playing spring sports should keep their regular class and performance dates in mind and speak with their coaches about possible conflicts or absences. We believe that performing is a vital part of the dancers� education and providing opportunities for our students to develop performing skills is an important aspect of our studio goals. The owner puts much thought and consideration into choosing costumes for the recital as to dance appropriateness, fit and style for the student, and budget for the parent. For the ballet & tap combo classes, we could choose a 2n1 costume where the basic part of the costume stays the same for both ballet & tap but there are additional accessories to work for both dances. This is a good option for our younger students so they don�t have to change clothes completely at recital. However, this is not always feasible or possible, depending on the songs they are dancing to. The cost of your costumes will not change even if we have to choose 2 separate costumes. The instructors will measure each child in December for their costumes. The most important measurement for a girl's costumes is the girth (starting at one shoulder, through the crotch, and back to the same shoulder - to measure around the body.) Costumes do not come in "made to order" sizes. They usually come in S, M, L - child and adult. When measuring and selecting sizes for costumes, we try to accommodate for growth before June as it is much easier to take up than to let out. 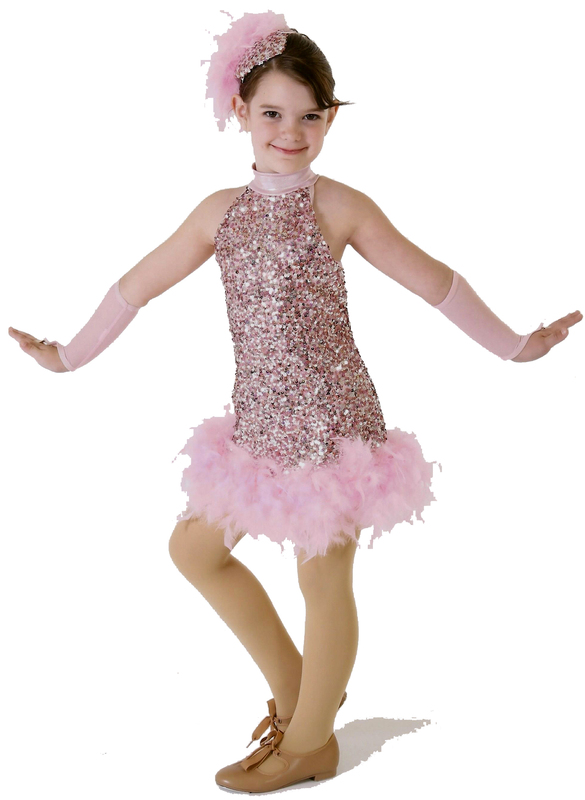 You are responsible for any minor alterations to your child�s costumes that need to be made. (strap adjustments, hemming, etc) We will try the costumes on in class as they arrive so we can check to see that it is fitting everyone properly. We have the final say at the time of costume arrival about how the costumes fit so that we ensure that the costumes fit the entire class all the same way. Costumes will be ordered by January. All costume and tuition balances must be up to date before Christmas break or the costumes will absolutely not be ordered. If your child should quit before Christmas break, you may request a refund on the payments you have made, minus a 10% administrative fee. All refund requests must be made in writing before December 15th. There will be absolutely NO refunds after December 15th. If your child quits after costumes are already ordered, you will be held responsible for the remaining payments, if any, left on your costume balance. If this balance has not been paid, you forfeit all payments and costumes. If the costume balance has been paid in full and you are up-to-date on all other payments, you may pick up the costume from us AFTER our annual recital. This insures that the costume remains a surprise to our audience and is not seen by anyone before that time. Please note that if your child quits after February, there is a service fee charged (see the section on �Commitment�) and there is a possibility that your costume will be used in a performance if the instructor feels that someone needs to step in for the good of the dance and the other students in the class. All payments will be applied to past due tuition first before funds will be applied to costume, shoes, tights or other items. Items not claimed within 90 days will be forfeited & assumed abandoned and will become the property of Farmington School of Dance, to use or dispose of as they see fit. Costumes will be handed out on or about the week of June 1st. Your account balance must be paid in full by that time, including June tuition. Costumes will not be handed out until all accounts are settled in full. (large child and adult sizes could be slightly higher. (Some alterations are included - you will be responsible for minor adjustments. Girls will also need a hairpiece with their costumes for pictures and recital. We use the same ones every year so if you keep yours from the previous year, there is no additional cost. New students will need to purchase this item in addition to the costume/recital fee listed above. More information about the hairpieces will be given out closer to our recital in June. including students taking ballet & tap only with a class that also does jazz. You will receive a payment booklet for your costume/recital fee payments. 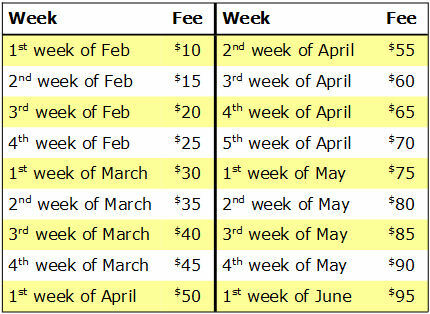 There is a $10 per month late fee added for costume/recital payments that are 30 days past due.